We all love our pets, but there are some aspects we may not like. One of these cat include problems with litter. It's not uncommon for litter to get trapped in your cat's paws after they have used the litter box. Because of this, it can easily end up all over the house. In order to remedy this, it's a good idea to invest in a litter mat. These mats are specially designed to be able to catch litter that manages to escape the box, keeping it from ending up in your carpet or on your furniture. Continue on to find information on some of the best litter mats available on the market today! What if my cat won't walk on it? Will it stop all litter-spreading? What do I do if the litter is wet and hard to clean out? What can I do about the chemical odor? This mat offers a lower-cost option for helping to avoid a litter mess outside the box. It's made to be gentle on your cat's paws while still collecting the litter that happens to come out on them. It also comes in six different colors so that you can find the ideal option for your home. 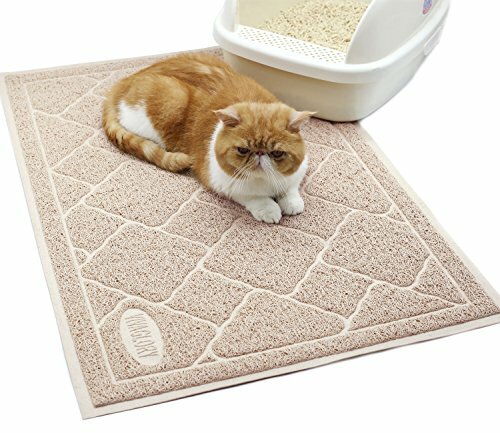 This durable mat is made to stick to the ground under the litter box so that your cat won't easily be able to make a mess of it. As your cat walks over it, the mat strives to grab the little bits of litter that sticks to their paws so that it won't end up all over your home. On top of the ability to catch litter, this mat is also made to be soft on your cat's paws so they'll be comfortable walking on it. The durable design can also ensure that you don't have to replace your litter mat too often. Mats like this are fantastic for helping to cut down on the amount of litter that can get everywhere in your home. It can be so frustrating trying to clean it out of every corner, and in some places you may not even expect. Using this, you'll have to do less cleaning overall as the mat itself is made to be easy to clean. There are also several colors, so you can choose something that works well for your décor or a color that won't show the litter as easily depending on your own personal preference. Customers do notice a chemical odor to the mat that can trouble them upon first getting this mat. Over time, the smell itself is something that will mellow out but it can be displeasing. In some cases, if the mat gets wet then it can be more difficult to get the litter out of it. Though in most cases, the Gorilla grip is made to keep it firmly stuck to the floor, it can sometimes be moved more easily than you might expect. This is a large mat that comes at a lower cost, meaning you quite literally get a lot for your money. It's also designed for cats to have to spend a little more time on, giving it the chance to pick up more litter depending on where it's placed. 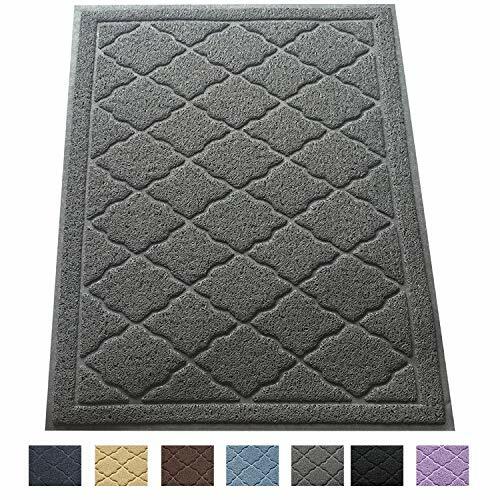 One of the biggest claims for this mat is that it's made to be very durable, that way you'll be able to get a lot of use out of it before you need to purchase a new one. It's made to be thick, but also lightweight so that it's efficient for picking up litter and easy to clean after. It comes in seven colors, allowing you the freedom to choose what you like most or what will be most effective. You also have the option of getting it in a jumbo size if you want even more coverage or have a very large litter box. This mat has a simple and elegant look. It's nothing fancy, but it gets the job done well. In all honestly, it's a mat that's going to get litter stuck in it so the look isn't always going to be ideal anyway. What's most important in a product like this is the functionality. The sizing is fantastic and can really help to pick up more litter than smaller options. It also ensures that you'll get exactly what you need whether you have one cat with a small litter box or multiple cats and large or multiple litter boxes. As with many other mats, there is a chemical smell that you might experience. If it's really a problem you may decide to wash it with a gentle soap prior to using it. Otherwise, the smell should decrease over time. While it is designed to be water resistant, some litters can become very difficult to clean if they get wet so it's a good idea to keep an eye on it and clean it often, especially if it's in an area where it might get wet. This mat comes in a huge size at a highly budget-friendly cost. It comes in four simple colors that will work well for just about any décor and is made to be perfectly safe for your pet, avoiding both BPA and phthalate-free. An awesome aspect of this litter mat is that it comes with a great money back guarantee that goes to show just how much the manufacturer stands behind their product. The bottom is made to be water-resistant and nonslip so you won't have to worry about your cat moving the mat and making a mess. It's also easy to clean by just shaking out the mat into your trash or running a vacuum over it. This can help a lot when it comes to the amount of time you might normally spend cleaning the litter out of corners of your home. 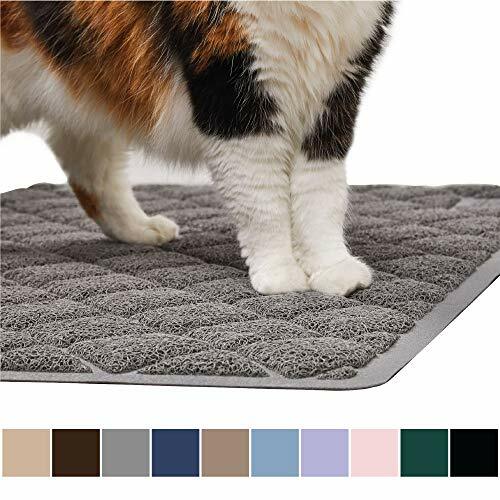 This large littler mat can give your cat plenty of space to walk around, ensuring that more litter is taken off their paws that might otherwise end up all over your home. It also has a nice design that won't become an eyesore in your home. Along with the functionality comes great customer service and a money-back guarantee. That way you can trust that you'll be able to try out the mat and get a refund or replacement if for some reason it is't meeting your expectations. It's important to remember that no matter how efficient it might be, this is a mat. It's not a robot following your cat around that will pick up every single piece of litter. Your cat may not always walk on it. In some cases cats leap out of the litter box right over it if they can. Because of that, it is possible that some litter might still get around your home. Some customers have found that it can be harder to clean than they expected, so it might be a good idea to clean it out often to avoid too much buildup. 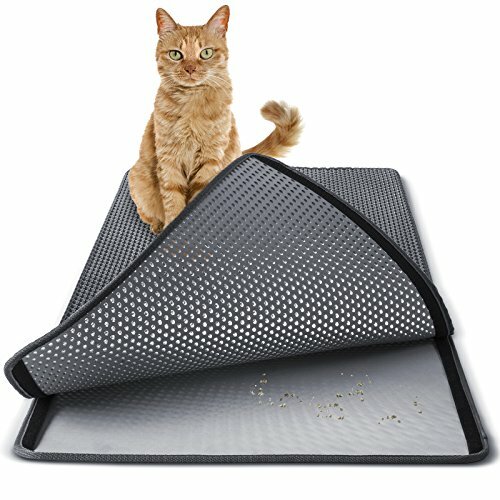 At a lower cost than other options, this mat works to pick up litter from your cat's paws and keep it from getting all over your home. It has a slightly different design than other litter mats, making it unique in the way it functions. This mat includes two parts including the top which works to catch litter and the bottom where the litter gathers to be cleaned up. It's a larger mat, made to give your cat plenty of space to walk on for the litter to be picked up efficiently. This is a highly durable option that isn't as prone to being clawed through as others, and it's very easy to clean. In most cases you'll simply be able to shake the mat into the garbage to get the majority of the litter out. The durability of this mat is fantastic. The heavy-duty design ensures that it will last longer than other options so that you can get a lot of use from it. Many have also found it to be very efficient when it comes to gathering the litter that may wind up outside the litter box. Due to the design, it's also made to be very easy to clean. That will allow you to get litter out in just a few minutes rather than having to spend hours every week trying to vacuum pieces of litter out of the corners of your carpet. Cats can be picky about the things they are willing to use, and in some cases cats are unwilling to even walk on this mat. In most cases this isn't likely to be a problem but it can happen. There can also be a chemical odor that comes on the mat when you first get it. Though it is a larger mat, it may not catch all the litter in every circumstance. This result can vary greatly depending on the unique situation. This long litter mat can help to ensure most of the litter on your cat's paws ends up caught in the mat rather than in your carpet. It's also made to be very easy to clean with a vacuum or just by shaking the litter into the trash can. The lifetime guarantee places this litter mat at the top of the list. If there's any way to really show that you stand behind a product it's by offering that much of a guarantee to customers. With this mat, you'll also get the peace of mind in knowing that it's non-toxic and made without any BPAs or other unwanted chemicals. It has a longer design, so that when setup correctly your cat will have to take a few steps on it rather than being able to simply hop over it. This helps make sure it will gather a lot of litter. The long design is a great addition because it offers more opportunity for the mat to pick up litter. This is a great way to help make sure that less of that litter makes it to the rest of your home. It also has a heavy duty design that can help the mat to last a long time. Many customers really love the the length of this mat and the trust that they can place in the guarantee. You'll be able to feel safe in knowing that if the mat doesn't meet your needs, you'll easily be able to get a refund or replacement. Because this is a larger mat, it may not be as easy for everyone to clean. Largely, you should just be able to vacuum it clean but if the litter on the mat gets wet it can become a bigger problem. There may also be a chemical odor that you'll notice upon first getting it. While it is highly useful, a litter mat is an imperfect device so it is important to continue cleaning up any litter you do find around the house. When you're shopping for a litter mat, it's important to keep in mind the size you're going to need. You'll also want something that is highly durable and easy to clean to make things more convenient. The size of the litter mat you choose not only needs to be enough to fit under your litter box, but also provide plenty of space for your cat to walk on. That way, there's more of an opportunity for litter on your cat's paws to fall off and get caught in the mat rather than ending up all over the house. In many cases, getting something larger than you might think you need is a great idea. 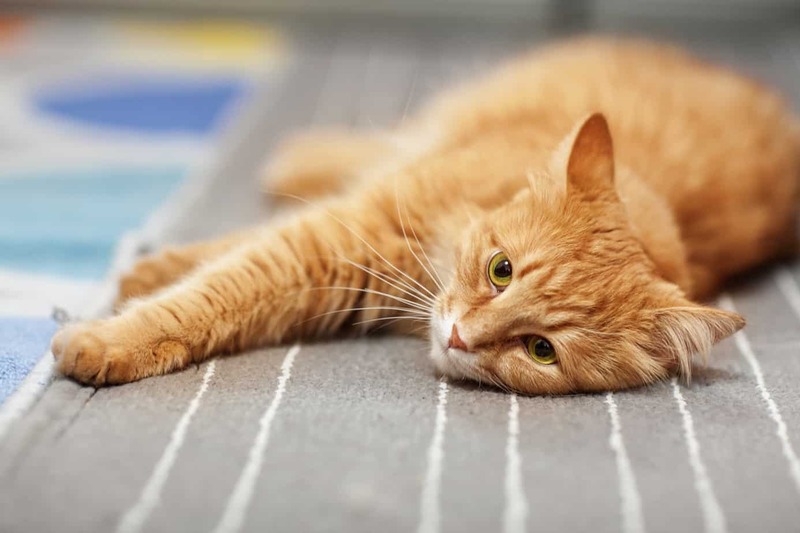 A durable mat is going to be able to last longer and be less prone to damage from your cat's claws. The purpose of a litter mat is also to make cleaning easier on you, so getting something you can easily get clean is ideal. One thing that can effect this is any wetness that gets into the litter on the mat, so if your litter box is located where the mat may easily get wet you may want to move it. Bigger tends to be better when it comes to litter mats, however that doesn't always mean you have to get the largest possible option. Consider how many cats and litter boxes you'll need to put on it as well as how large the litter box is. Then think about how much space you want your cat to have to actually walk on. All of these variables will help you with choosing the ideal mat. Some cats can be picky. It may just take a little time for your cat to get used to the new addition to their litter area. In other cases, some positive reinforcement might help to get your cat more comfortable. Try giving them treats when they step on the mat or just praising them. If they still don't become comfortable, then you may need to find a mat made from a different material. It's very important to keep a realistic mindset while you're looking for a litter mat. While it is designed to help with keeping litter away from the rest of your house, it isn't an absolute solution. Some litter can still get around your house, but it should be less than you would experience without the mat. That way, you have less work to do when it comes to cleaning the escaped litter up. Wet litter can be a problem no matter what material it is on. This can make it harder to clean off floors, out of the mat and even out of the litter box. Once you have gotten the mat cleaned up it might be worthwhile to look for a different litter. In some cases, a non-clumping litter can help with this kind of issue. Otherwise, try to set up your litter box and mat where it will be unlikely to get a lot of water onto it. This can really depend on the specific mat you buy. If you're highly keen on not getting something that might have a chemical smell than it might be better to shop in a store where you can tell prior to purchasing it. Otherwise, you may be able to wash the majority of the smell off with a gentle cleanser. Over time, those chemical smells should also wear away as it is used and cleaned repeatedly. A cat litter mat can be a big help around the house when it comes to avoiding litter ending up all over the place. If you can, it's a great idea to set it up in a way that requires the cat to walk on the mat prior to and after using the litter box for the highest level of efficiency. This goes well with the appropriate cat litter and litter box. Most of the mats in this list come at a low cost and there are a variety of sizes and colors to choose from so that you can get the ideal fit for your home. Many also have money-back guarantees so that you can feel safe in trying them out as you look for the perfect litter mat.